Aberdeen manager Derek McInnes believes consistency is hard to come by in an improving Scottish Premiership. Aberdeen boss Derek McInnes feels this season has proved the most difficult to get a consistent run of victories. The Dons have had two many draws for the manager’s liking despite only having two defeats, with a trip to Tynecastle today to face the league-leaders Hearts another challenging hurdle early in the season. 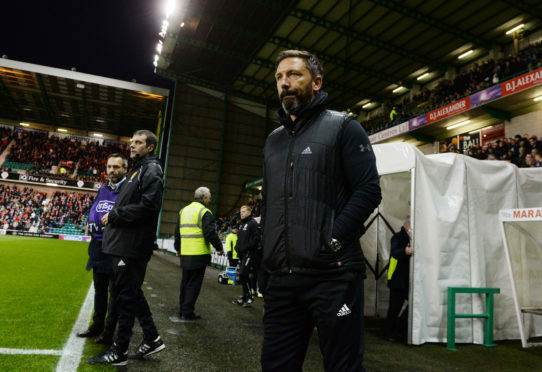 McInnes reckons the Dons will still come good as the campaign goes on but the impressive starts of other clubs, namely the Edinburgh clubs, has shone an additional spotlight on their league form. He said: “It’s a long season and it’s right to highlight strong starts from Hearts and Hibs and Hearts in particular have been fantastic. They have done really well so far but for us it’s a long way to go and you get judged at the end of the season. “We feel that we have had our own issues to contend with in terms of injuries and suspensions. So far we’ve only had two defeats in the league: away to Celtic when we feel we were unlucky and at home to Kilmarnock when we played for 86 minutes with 10 men. For us it’s not been the start we would have wanted with one or two too many draws than we would have wanted. This week saw four Dons players return from international duty, with Graeme Shinnie and Scott McKenna joined in the squad for Scotland’s friendly with Portugal by Gary Mackay-Steven and Mikey Devlin. The inclusion of Devlin, a January signing from Hamilton, is one McInnes had been hoping for, given the positive early impression he has made at Pittodrie. McInnes said: “Mikey was maybe one we were looking at for the original squad. I have been pleased with his performances. We are not overly blessed with centre-back options and I was kind of hoping he would be in and around it anyway. “Shinnie and McKenna got on the pitch and Gary as well for the second game and making an impact. “But I think it is good for Mikey to show he’s not too far away, to be honest. I think it’ll whet the appetite for all the players who were there and we were represented quite strongly in that second game, so it shows if they are playing well here, the national manager will certainly consider them. Stevie May, James Wilson, Niall McGinn, Scott Wright and Connor McLennan could all be involved after overcoming injury problems over the break.